iMacsoft PDF to Html Converter for Mac is a stable program for converting PDF to Html without any quality loss. And in the current days, it is one of the most powerful tools for Mac users to get Html web pages from PDF documents and make PDF files searchable on the internet. The program is so powerful that it can finish the whole conversion process independently without requiring any assistance of other software or plugins. In addition, iMacsoft PDF to Html Converter for Mac can also shorten your conversion time by providing with batch conversion function and page range option, which makes it possible for you to convert only the needed pages. With this PDF to Html application, you can easily convert PDF to Html on Mac retaining the original text, layout, tables, images, etc. just by adding files and click “Convert”! 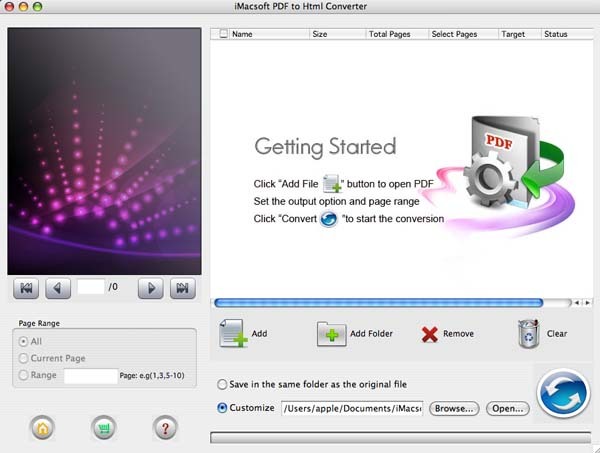 Now free download iMacsoft PDF to Html Converter for Mac to have a try. iMacsoft PDF to Html Converter for Mac support to convert PDF files of various languages, including English, Turkish, Thai, Latin, Korean, Greek, Cyrillic, Arabic, Japanese, and Chinese. With advanced encoding and decoding technology, iMacsoft PDF to Html Converter for Mac assures you fast conversion speed and sound output quality. iMacsoft PDF to Html Converter for Mac can convert PDF to Html without changing the original text content, page layouts, images vector graphics, fonts and bookmarks. iMacsoft PDF to Html Converter can convert PDF to Html on mac all alone without requiring of Adobe Acrobat or Adobe Reader. Multiple PDF files can be converted at one time, for batch conversion is supported. To save time, iMacsoft PDF to Html Converter for Mac allows you to convert only the needed pages by setting a page range. You are flexible to convert all pages, current page as well as some certain ones. You can preview the added files in preview panel page by page, and make sure which one to convert. How to convert PDF to HTML files on Mac?